This is the final in a series of profiles on the candidates for Gresham Council Position 4. Mario Palmero wants to continue building bridges between Gresham's city leadership and the community. He agreed to join the council in 2012 when he was appointed to fill a vacant seat, because he wanted to see more representation in the group. 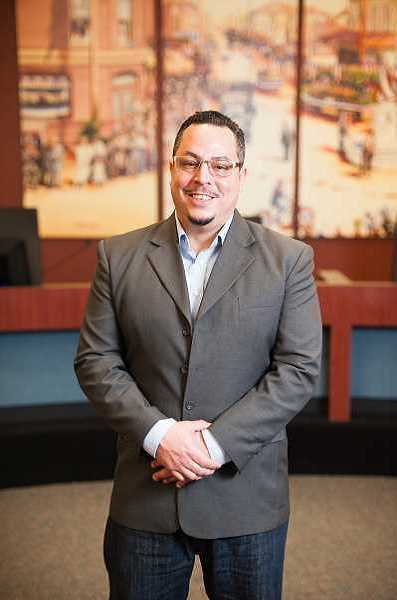 Living on the west side of the city for more than 15 years, speaking three languages and being a minority, Palmero thought he could help connect with people. Palmero, 42, is used to working with a variety of people. He is a benefits coordinator for the Oregon Department of Human Service's Self-Sufficiency Program in Gresham. He has also volunteered with Rockwood Weed and Seed, Habitat for Humanity, the SMART youth reading development program and the AARP Vita Tax-Aide program. He was sworn into office for a full term in 2015 and served as council president in 2016. Some of his assignments while on council have included the Gresham Task Force on Homelessness, Johnson Creek Watershed Council, JOIN and Citizen Engagement. The Outlook: Why are you running for reelection? Mario Palmero: We still have stuff we need to accomplish. I have learned a lot from my time on council, behind-the-scenes information people don't know. You serve every day of the week, working like 30 hours a week on City Council. I still have things I want to work on. We want to have options for families in Gresham. We can't solve all the problems, but we can give opportunities. Outlook: What issues are you focused on? Palmero: A community center is a big thing — the community wants one. I am going to push for it soon. We need a place where people can congregate. I am thinking about using the marijuana tax, from the sale of recreational marijuana, to support the center. Homelessness and the housing crisis are big issues. We need to get people from being homeless to self-sufficient. Keeping people in housing, and showing them how to budget finances, is the most difficult part. We need more after-school programs for kids. The Rockwood Boys and Girls Club is a great example — kids need something to do after school. I am proud of the investment we have made in Rockwood. Too many people are here now in a small area, so we need more. We have the catalyst site we are working on, that is going to be tremendous because we will have a farmer's market year-round and there will be opportunities for people to open businesses. Outlook: What are you hearing from the constituents? Palmero: There is concern about a lack of renter's rights, people being evicted for no-cause. When was the last time a senior on a fixed-income got a raise from the federal government? I think it was like two or three years ago, even though the cost of living keeps going up. And there is a lack of senior housing. We have to do something about that. Public transportation is getting better, the North-South routes are being established. People are able to go to work. Affordable childcare is another problem. The community wants to be more involved, take an active role. So many people apply to the task forces, so it's hard to make those choices. We need to do a better job to make sure people have the ability to volunteer. Outlook: What sets you apart from the other candidates? Palmero: What sets me apart is I have the experience that is needed. We have so many things on the line, all these things are happening that will shape Gresham in the coming years, and I have the experience to deal with them. I am a minority. I come from West Gresham. I am a social worker who has worked with low-income and homeless people, so I bring a different perspective. Outlook: Why should people vote for you? Palmero: I think I have done a pretty good job of listening to their concerns and bringing up a lot of issues in the community. We can find solutions to all of this.